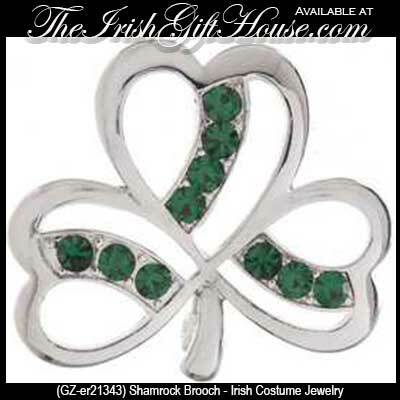 This shamrock costume jewelry pin is enhanced with green glass accenting. This Irish costume jewelry shamrock pin is gift packaged with the following blessing: For each petal on the shamrock this brings a wish your way good health, good luck and happiness for today and every day. This costume jewelry shamrock pin measure 1 1/4" wide by 1 1/8" tall. The lucky shamrock costume brooch features green glass stone accenting and is made of silver tone zinc. This Irish costume jewelry features shamrock earrings that are enhanced with green glass accenting.